• Alternate Mode – The physical USB-C connector can also support other non-USB protocols, including DisplayPort, MHL, HDMI, and Thunderbolt. I’ll go into more detail below, but suffice to say that not every device supports every Alternate Mode protocol, and this will be tremendously confusing for buyers! • Power Delivery – Although not a data protocol, USB-C also allows for up to 100 Watts of power delivery to connected devices. But here again, there are two different specifications and a multitude of different configurations that will be encountered. • Audio Accessory Mode – There’s also a spec to have analog audio use this port. The core issue with USB-C is confusion: Not every USB-C cable, port, device, and power supply will be compatible, and there are many different combinations to consider. The newest, most full-featured devices (such as Apple’s brand-new Touch Bar MacBook Pro) will support most of the different uses for the USB-C port, but typical older devices only support basic USB 3.0 speed and (if you’re lucky) Alternate Mode DisplayPort. But the issue of incompatible cables is even more serious. Many companies, including my go-to source, Monoprice, are building USB-C cables of various quality and compatibility. If you’re not careful, you can neuter or even damage your devices by using the wrong cable. Seriously: Using the wrong cable can damage your machine! This should not be possible, but there it is. Some cables with USB-C ports on both ends can only pass 5 Gbps data while others are compatible with 10 Gbps USB 3.1 gen 2. Other cables can’t be used for power delivery or are incompatible with Alternate Mode Thunderbolt. Check out the Monoprice 3.1 10 Gbps/100-Watt USB-C to USB-C, 3.0 5 Gbps/15 Watt USB-C to USB-C , and 2.0 480 Mbps/2.4 A USB-C to USB-C cables. Why do all these variations even exist? And then there are the cables with different connectors on each end: Monoprice sells an awesome USB-C to USB 3.0 10 Gbps adapter but also has one that only goes to 5 Gbps and another that’s limited to 480 Mbps USB 2.0. And they all look almost identical. What a nightmare for consumers! Note: I don’t mean to be picking on Monoprice here. I love their cables and just ordered over $100 of carefully-selected Monoprice USB-C cables. But their wide range of USB-C cables aptly illustrates the very real problem of incompatibility, so I’m using them as an example. Literally every vendor of USB-C cables, from Apple to Belkin to StarTech, has this same issue. Now we turn to an even-more confusing topic: Thunderbolt 3. Mac owners, since the debut of the early-2011 MacBook Pro, have become accustomed to the Mini DisplayPort connector serving double-duty as both a graphics and data port. And they’ve also gotten used to the head-slapping experience of plugging a Thunderbolt cable into a basic Mini DisplayPort jack and finding it doesn’t work. • Not all USB-C device ports have the same capability – Many are data-only, some can do data and video, and a few can do data, video, and Thunderbolt 3! • Thunderbolt 3 requires a special cable – Although it looks exactly the same as a regular USB-C cable, you need a special Thunderbolt 3 cable to use Thunderbolt 3 devices! • Thunderbolt 3 devices look just like regular USB-C devices – Most ordinary devices with a USB-C cable are limited to 5 Gbps (or even less) of USB data but Thunderbolt 3 devices pass PCI Express data and boast 40 Gbps of throughput! 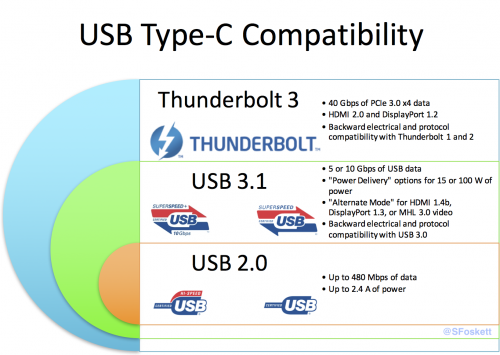 Thunderbolt 3 ports and cables ought to be backward-compatible with USB 3.1 Type-C cables, ports, and devices. But of course they will run at that slower speed and lack Thunderbolt connectivity in that case. Thank the maker for backward compatibility! So owners of Thunderbolt 3-capable machines like the new late-2016 MacBook Pro must be very careful when buying devices and cables to make sure they get the performance they expect. Most of Apple’s current USB-C accessories and cables will work with the new MacBook Pro (it’s backward-compatible) but might not deliver the full Thunderbolt 3 experience. And owners of the older 12″ Retina MacBook are even more at risk, since, although Thunderbolt 3 devices will plug right in, they will not function at all! Since Thunderbolt 3 can also include both data and video, it can be very confusing knowing whether a given computer, cable, and device are compatible. For example, a Thunderbolt 3 cable can support two 4K 60 Hz monitors or even a 5K display, while a USB-C cable is limited to just one 4K monitor.